I've had the pleasure of being selected to a jury after being called to serve, and I've been sitting through a trial this week. Outside of falling behind on work I have to say for the most part it has been a very interesting experience. I didn't want to do it of course, as I've found is the case for everyone who was called. I would say most of the people called made it fairly obvious they did not want to be there…showing up late, texting during jury selection, and then of course the excuses! There were many people who would have said just about anything to get out of serving. 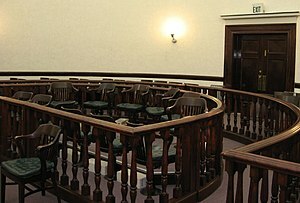 (the experienced jurors knew when to take a break and thus be skipped over for cases). I was very much impressed with just how much people didn't care about the whole process. In the particular case I'm serving on during the juror selection process one potential juror stood up and passionately said "I can't serve on this case for personal reasons I will not discuss." The Judge excused her, and quickly 50 other hands shot up…they all had to be excused for personal reasons. I was so tempted to do the same, but truthfully I couldn't. My only personal reason would have been because I didn't want to spend a week (or weeks) serving on jury duty, and that simply wasn't good enough. But even more I realized that despite the many, many inefficiencies I've seen during this process I still realized deep down I'm in awe of the system. I realized how much I believe in the system of a trial by a jury of your peers. The system produces a random, diverse group of people who most likely know very little about the law to discuss and ultimately come to an agreement on your case, ensuring (ideally) a fair trial. How amazing is that? And as a big believer in that process I simply couldn't skip out of jury duty because I didn't want to do it. If everyone skipped out because they didn't want to do it, who would be there to serve?